Accuweigh’s Brisbane branch recently serviced and calibrated a set of four wheel weighers for the Volvo trucks distribution centre at Richlands. The wheel weighers are used to check that all individual wheel loadings as well as axle loadings are within factory specifications. The CAS wheel weighers are ideal for this application with their cast aluminium construction allowing the wheel weighers to be easily moved by a single person. Multiple wheel weighers can be interconnected for easy viewing of wheel weights up to four wheels at a time. These wheel weighers have a low profile of 39mm and are available with dummy pads to allow all wheels and axles to be at the same height for the highest possible weighing accuracy. 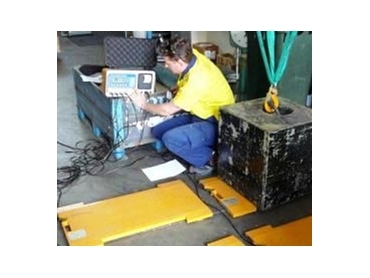 Accuweigh is an Australian industrial weighing company with branches in all mainland states ensuring national backup and support all over Australia for wheel weighers, axle weighers and truck weighbridges.